November, 2014 | H&R Group K.K. Winter in Japan can get a touch on the chilly side, can’t it. So, what’s the best way of warming up? Sitting under a kotatsu? Attaching hot kairo heat pads to your body? How about walking through fire? Okay, maybe the latter one is a bit extreme, but that doesn’t stop the priests and followers at Akibasan Entsu-ji doing just that. 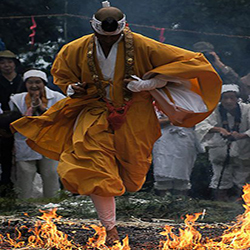 Hiwatari Shinji is a Buddhist fire walking ritual performed throughout Japan, and is held in the Akibasan Entsu-ji shrine on the second Sunday of every December. The temple itself was founded by the great Buddhist teacher Kūkai (posthumously known as Kōbō-Daishi) who preached a Mikkyō esoteric tantric form of Buddhism, and enshrines the fire kami (or god) Sanjakubo Daigongen. Born in Shinano in modern day Nagano prefecture, Sanjakubo left home to become a wandering priest, begging as a way of subsisting. When studying the religious rites of Acala (or Fudō-myōō in Japanese), a wrathful sword wielding deity engulfed in flame, Sanjakubo felt a sword in his hands which enabled him to fly. Mounted on the back of a white fox he flew southwards where he landed on Mt Akiha or Akihasan, thus becoming Akiha/Akiba kami, a protector against fire. Akiba kami gained great popularity in the mid-Edo period, which is perhaps when the right hand temple at Entsu-ji became dedicated to him. At this time both Shintoism and Buddhism were worshiped together, with Shinto shrines and Buddhist temples coexisting side by side. However the Meiji government outlawed this system, forcing followers to choose one or the other, destroying one place of worship. Fortunately the the shrine at Entsu-ji was left untouched and the traditional style can still be seen to this day. There are various forms of worship of Akibasan throughout the country. At Akibasan Entsu-jiin Atsuta the first ritual performed is Shichijuugozen-jinku in which mochi rice cakes are offered up to 75 mountain gods. Following this 20 to 30 shugenja dressed in white kimono (ascetic mountaineering priests who practice severe self-discipline and abstention and equate enlightenment with attaining oneness with kami) pray for better fortune, improved business, and the growth of family prosperity. Sutras are recited, conch shells are blown and the shugenja hold question and answer sessions with followers. After this it is time for the Hiwatari-shinji, the fire walk. The Homa (goma) ritual of consecrated fire is unique to Vajrayana and Esoteric Buddhism. The daily burning of wood offerings is performed by qualified priests and is believed to have a powerful cleansing effect spiritually and psychologically. During the Hiwatari Shinji, this ritual is taken to another level, with a burning pathway placed before the shugenja priests. To elevate to a higher level of concentration they chant kuji-in, nine syllable mantras common in Mikkyō Buddhism, before striding out across the heat. The ritual’s purpose is to pray for protection from fire and other tragedies that can come from the elements, as well as against theft, traffic accidents, poverty and early mortality. Once the shugenja have finished, it’s your turn. No, really. After the priests come their various followers, but anyone can take part in the cleansing ritual if you have the bottle (and a high pain threshold). If you want to take part, or even just witness this remarkable festival, you should head to Akibasan Entsu-ji shrine near Atsuta jinga. Prayers and rituals will be going on from 7am, and the fire walking begins at 7pm going on until 9pm. To get there take the Meijo subway Line to Tenma-cho. (If you are travelling anti-clockwise, be sure that you are on the circle route, and not heading out on the Meiko line to Nagoya-ko). From there take exit 1 and walk straight for approximately 3 minutes. On the Meitetsu line get off at Jingu-mae, cross the road towards Atsuta shrine, and turn left. It takes about 8 minutes. Winter in Japan can get a touch on the chilly side, can’t it. So, what’s the best way of warming up? Sitting under a kotatsu? Attaching hot kairo heat pads to your body? How about walking through fire? Okay, maybe the latter isn’t the best of ideas, but it doesn’t stop the priests and followers at Akibasan Entsu-ji doing just that. Hiwatari Shinji is a Buddhist fire walking ritual performed throughout Japan, and it is held in the Akibasan Entsu-ji shrine in Atsuta on the second sunday of every December. The temple itself was founded by the great Buddhist teacher Kūkai (posthumously nown as Kōbō-Daishi) who preached a Mikkyō esoteric tantric form of Buddhism, and enshrines the fire kami (or god) Sanjakubo Daigongen. Born in Shinano in modern day Nagano prefecture, Sanjakubo left home to become a wandering priest, begging as a way of subsisting. When studying the religious rites of Acala (or Fudō-myōō in Japanese), a wrathful sword wielding deity engulfed in flame, Sanjakubo felt a sword in his hands which enabled him to fly. Mounted on the back of a white fox he flew southwards where he landed on Mt Akiha, or Akihasan becoming Akiha/Akiba kami, a protector against fire. Akiba kami grew in popularity in the mid-Edo period, which is perhaps around the time when the right hand temple of Entsu-ji became dedicated to him. At this time both Shintoism and Buddhism were worshiped together, with Shinto shrines and Buddhist temples coexisting side by side. However the Meiji government outlawed this system, forcing followers to choose one or the other, destroying one place of worship. Fortunately the the temple at Entu-ji was left untouched and the traditional style continues to this day. Throughout the country there are various ways for followers to worship Akibasan. At Akibasan Entsu-ji the first ritual performed is Shichijuugozen-jinku, in which mochi rice cakes are offered up to 75 mountain gods. Following this, 20 to 30 shugenja (ascetic mountaineering priests who practice severe self-discipline and abstention, equating enlightenment with oneness with the kami) dressed in white kimono, pray for better fortune, improved business, and the growing prosperity of the family. Sutras are recited, conch shells are blown and the shugenja hold question and answer sessions with followers. After this it is time for the Hiwatari-shinji, the fire walk. The Homa (goma) ritual of consecrated fire is unique to Vajrayana and Esoteric Buddhism. The daily burning of wood offerings is performed by qualified priests and acharyas and is believed to have a powerful cleansing effect spiritually and psychologically. During the Hiwatari Shinji, this ritual is taken to another level, with a burning pathway placed before the shugenja priests. To elevate to a higher level of concentration they chant kuji-in, nine syllable mantras, common in Mikkyō Buddhism, before striding out across the heat. The ritual’s purpose is to pray for protection from fire, and other tragedies that can come from the elements, as well as theft, traffic accidents, poverty and early mortality. Once the shugenja have finished, it’s your turn. No, really. After the priests come various followers, but anyone can take part in the cleansing ritual if you have the bottle (and a high pain threshold). If you want to take part, or even just witness this remarkable festival, you should head to Akibasan Entsu-ji shrine near Atsuta jinga. Prayers and rituals will be going on from 7am, and the fire walking begins at 7pm going on until 9pm. To get there take the Meijo subway Line to Tenma-cho. (If you are travelling anti-clockwise, be sure that you are on the circle route, and not heading out on the Meiko line to Nagoya-ko). From there take exit 1 and walk straight approximately 3 minutes. On the Meitetsu line get off at Jingu-mae, cross the road towards Atsuta shrine, and turn left. It takes about 8 minutes. Many people know of the exceptional value of a Japan Rail Pass, which allows tourists to ride the train systems in Japan for a set period without paying individual ticket prices. Unfortunately, the Rail Pass is only available to non-residents of Japan, so if you’re not a tourist, then you’re out of luck! Most notable is the Seishun Juhachi Kippu, which is seasonally available and offers five days of “norihodai travel” (as much as you want), limited only to non-reserved seating travel on local and rapid trains belonging to Japan Railways. That even includes some of the slower shinkansen (bullet trains), I believe. If you are travelling in the Kansai area for a few days, the Surutto Kansai Ticket is one of the better rail passes available in Japan. One of its advantages is that it does not only cover the train and bus lines between cities, but also most city buses and subways inside the cities. The Surutto Kansai Two Day Ticket and Surutto Kansai Three Day Ticket are rail passes, providing unlimited usage of trains, subways and buses in the Kansai Region (around Osaka and Kyoto), with the prominent exception of JR trains. The Aozora Free Pass is offered by JR Tokai, and it allows the holder one day of unlimited use of local trains in the Chubu area. The pass is only available on weekends and national holidays, but at (roughly) 2500 yen per ticket it can be a great deal if you are going “day trip distance” from the city. I personally use this ticket quite a bit while hiking in the mountains surrounding Nagoya. For an absolutely flawless description of riding the train in Japan, and many more discount ticket options please see japan-guide.com’s page, or the JR Group Website. For detailed timetable information which includes JR and other trains, and flight information, please see the Hyperdia or Jorudan Route Finder websites. This not only tells you the fastest and most convenient ways to travel, it also gives detailed fare information, and different travel options. For those who prefer a voice on the phone, Japan Travel Phone is a nationwide telephone service for those in need of English language assistance and travel information. Dial 0088-22-4800 (toll-free outside Tokyo and Kyoto). Service hours: 9:00 a.m. to 5:00 p.m.daily. Swimming is, it is often stated, perhaps the best form of exercise, and as a nation that takes its health particularly seriously, it is perhaps no surprise to find that there are swimming pools for public use all over Japan. So, whether it is to improve stamina, help with muscle building, or to lose a few pounds, why not check out your local pool? Below are a few things you should know about public swimming pools in Japan. Whether male or female, anyone swimming at a public pools is required to wear a swimming cap. And while some of the more follicly challenged amongst us gentlemen may feel it an absurd undertaking when we have more hair on our chests than on our heads, pool culture in Japan demands that we must follow the lead of our more hirsute companions. 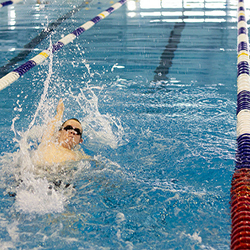 Swimming caps (often cloth as opposed to the nylon sort worn by professional swimmers) can be found in most sports stores. If you do not have a cap your local pool may be able to provide you with one for your visit. Many public pools in Japan have two main sections; one for swimming, with aisles for slow, medium and fast swimmers; and one for walking. That’s right, walking. One of the most common uses for public pools in Japan is resistance walking. This form of exercise – walking lengths of the pool – is of particular benefit to those requiring physiotherapy exercise (athletes with lower body injuries especially) as well as the elderly. It is the latter that are most common in Japan’s public pools, particularly during week days. Perhaps out of courteousness for those elderly patrons, Japanese public pools are generally not a place where you can take the children for a splash around, playing Marco Polo and cannonballing (in fact diving of any kind is somewhat dangerous as there is likely to be no deep end thanks to the perambulatory nature of half of the pool). While there are exceptions to this, particularly at weekends and on hot summer days, compared to pools back home swimming is a relatively kid free zone. For those of you who take your swimming seriously, this may be a welcome respite from the horseplay you find in many swimming pools, however it is something of a shame when you consider that swimming is not mandatory in Japanese schools, and many children grow up either afraid of the water or unable to swim. One of the great things about swimming is the peace and solitude of being fully submerged under water. In fact it can often feel as if you are all alone in the pool. If you do not pay close attention in Japanese public pools, this may indeed be the case. Every hour (usually on the hour or at five minutes to), the pool is entirely cleared while staff perform safety inspections and the life guards are changed. This change is signaled by music being played overhead, at which time everyone vacates the water at a leisurely pace. At some places swimmers will wait out the inspection in poolside saunas, while at others an overhead announcer will lead everyone in group stretching exercises. Sumida City Gymnasium near Kinshicho station has a 25m pool with seven lanes as well as a 50cm pool for infant bathing. Katsushika City Sogo Sports Center has a 25m pool as well as a 15m pool for beginners and is accessible from Aoto Station on the Keisei Line. If you are looking to spash about, Edogawa-ku Sports Land has a 50m pool split into sections for walking, swimming lengths as well as just having fun. The nearest station is Shin Koiwa. Setagaya pool 10 minute walk from Hachimanyama Station on the Keio Line, has a 25m pool, a pool for children, a Jacuzzi , and a walking pool and slide. It can get busy with children on weekends. Kinuta Koen pool has a full 50m pool for which cards can be purchased at the counter. It can get busy on weekends, but if that doesn’t put you off head to Setagaya-ku. Sogo Taiyuan Swimming Pool in Gotanda is 25m, but as part of a school, it is advisable to call to confirm public usage times. For a fuller listing of swimming pools open to the public, check out the extensive list on swimia.com the details for which have been provided by the general public. – Four parking spots available: two in the front and two in the rear of the building. – Japanese, English and German spoken. Closed: Thursdays, Sundays and public holidays. – Parking space is limited and has to be reserved in advance (by telephone). Public transportation is recommend if possible.